Let’s assume that I am a little bug – maybe quite a nice bug, I may be green with black dots and six legs. I live on a tomato. My teeth are very tiny, so I can’t chew through the skin of the tomato. I like to take short walks. When I walk from Point A to Point B, I always go in a straight line because that is the shortest distance. I have short legs so I get tired easily, and I want to take the shortest path. Actually, it’s not really a straight line at all since it is going around the outside of the tomato; instead it is an arc, but I don’t know that, and I am convinced that it is a straight line. Just then, my best friend, Bobsie, comes along. Bobsie can have some odd ideas sometimes, but she’s pleasant enough, and she’s my friend. But she’s not very practical like me. Bobsie says, “Oh, he’s right you know. There really is a Magic Castle, and Jo Jo lives there. “How do you know?” I ask her. Jo Jo says nothing. I can feel myself getting annoyed. What is wrong with Bobsie? Is she lying or is she delusional? Why would she lie to me, who am her friend? Of course, she cannot remember the Magic Castle, or the ducks, or Jo Jo, or anything else, it is all silly and imaginary. It doesn’t exist. If the Magic Castle did exist at the center of the tomato, that might explain how it is that there might be wormholes which could enable extra-terrestrial visitors to travel faster than the speed of light from distant galaxies. It might explain how one can see into the future, or teleport from place to place. Or how one can appear and disappear, or how an electron can be in two places at once. Or how one can fly on a magic carpet from one world to another. Or how there can be many parallel universes – or gods and angels, or how one can have the sense that one has existed many times in the past, or even remember friends who are otherworldly beings. It might be that one is linked always to the Magic Castle, and one can travel along beams of light and then go home again. 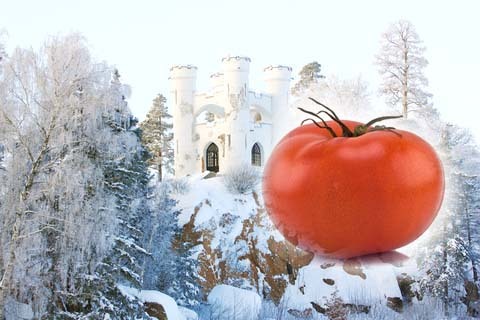 And if there were a Magic Castle at the center of the tomato on a different dimension that we cannot see, why there might be another dimension beyond that one – in the center of the center of the tomato – and maybe one beyond that too – in the center of the center of the center of the tomato, where there is a Castle even more Magical than all the rest. “Yes, please do; I’d love to see you there; next time I’ll give you a tour of the Castle,” said Jo Jo, and then he is gone in the wink of an eye. “That’s nonsense!” I say to Bobsie, and I continue walking, with my six legs, on along my straight line from Point A to Point B and then back again.